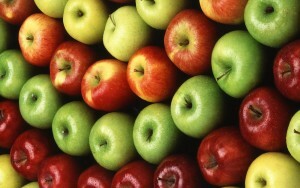 Apples are good for your skin, and its believed they have such good properties that they could make your skin flawless. They contain iron, which makes your cheeks glow and give you a healthier look. Apples have several properties that make them good for the skin. They are full of fiber, which helps maintain good digestion, which is important for a healthy skin. Apples also contain vitamins A, C, iron, calcium, potassium and phosphorous and you have a very compact and delicious food that helps you to look better. The polyphenols in apples function as antioxidants. They contain antioxidants that fight the free radicals which eventually lead to causing wrinkles, just like blueberries. So don’t forget, a apple a day keeps a wrinkle away!